Martin Luther helped spark a revival in the church that continues today. If you worship Jesus as a part of any Protestant community, you can thank God for using this German monk. Luther’s self-salvation project eventually waned and ultimately dissatisfied his soul. While he pursued a doctorate in Bible, he began to see how the gospel reveals justification is by faith, not works. This doctrine became the hallmark of Luther’s theology. After God revealed this to him, primarily through Psalms and Romans, Luther stated: “Here I felt as if I were entirely born again and had entered paradise itself through the gates that had been flung open.” God’s salvation transformed Luther’s life and led to one of the most courageous, individual acts in Western (if not world) history: nailing his Ninety-Five Theses to the Castle Church in Wittenberg. On All Saint’s Eve, October 31, 1517, Luther marched to the Castle Church to nail his theses to the door. Church doors in those days doubled as community message boards. Due to the next day (All Saint’s Day) being a church holiday, nearly everyone in Wittenberg would have seen his post within 24 hours as they arrived for worship gatherings. Luther did not want to start a revolution. He intended for the discussion to be primarily an academic affair–after all, Luther was an academic theologian at the time. Posting something on the church door then was like writing a blog post today. But he did not expect it to gain much traction alongside all of the other “postings.” However, what ensued was a city-wide, public discussion of the church’s practices. Luther wrote in Latin, which only academics and other educated people would have understood. But because of the newly invented printing press, his Theses were translated to German. They didn’t spread as quickly as a viral video on YouTube, but they were distributed all over Germany within two weeks and around Europe within two months. Not bad for the sixteenth century. 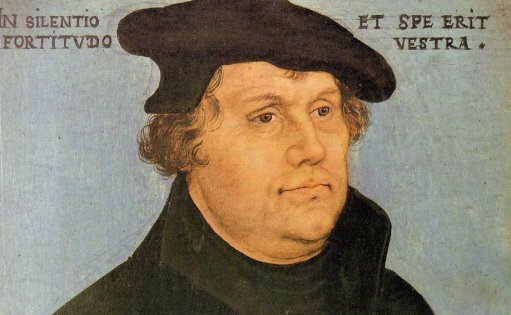 Luther was not without flaw of course, but his legacy continues today. Any community of believers who proclaim the good news that we are justified by grace through faith in the Lord Jesus and not our works can thank God for Martin Luther. It was God, after all, who gave Luther the grace to recognize error, point to the Scriptures, repent of sin, and stand for truth. It was God who gave Luther strength and endurance and courage to stand up against man-made teaching. On this Reformation Day, we do not praise Luther. Luther’s legacy does not lie in his boldness or theology or being a revolutionary. His legacy lies in the fact that he testified to and trusted in One greater than himself, the Lord Jesus, the One on whom our salvation wholly depends. Hello! I came across your article. I never knew the history of Martin Luther and appreciate the information! It got me thinking and I am wondering your thoughts or anyone else s… Regarding “Luther was not without flaw of course, but his legacy continues today.” We are all born into sin, this we know, even Martin Luther. But Jesus Christ was without sin. He (Jesus) told Peter, His disciple, that He will built His Church upon him and, ” the gates of hell shall not prevail against it.” (Matthew 16:18). Therefore, being that Jesus is the Son of God and His promises are creditworthy, the teachings of the Catholic Church at the time were accurate and true despite the thoughts of Martin Luther. There was no error in the first place with the teachings of the Catholic Church because God does not abandon His promises. Yes, members of the Church (you and I) have sin upon our souls and each member has errors but the Church’s teaching is without. Or what do you think? And so we confess that Luther, a sinner like all of us, was blessed by the Holy Spirit to bring the true Gospel back into the light, a true Gospel as taught by the ancient and apostolic church, against which the gates of hell shall not prevail. He was not bringing something new to the church, but restoring the church to its original doctrine(s). Study of the church fathers confirms as much. If interested in Luther’s history, Roland Bainton’s short book “Here I Stand” is highly recommended.